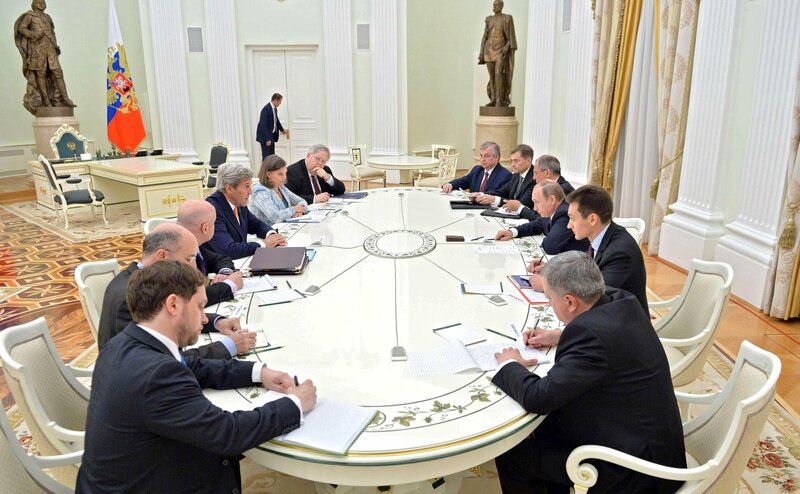 Russian President Vladimir Putin and U.S. Secretary of State John Kerry held talks in Moscow, July 14 evening. Russian President Vladimir Putin and U.S. Secretary of State John Kerry, during the open part of their talks in the Kremlin on July 14 evening, expressed hope for progress in bilateral talks on Syria and other issues. Russian Foreign Minister Sergey Lavrov, whose talks with his American counterpart are scheduled for Friday, July 15, also took part in the meeting. "Distinguished Secretary, dear colleagues, allow me once again to welcome you to Moscow. I’d like to note our mutual efforts to settle and resolve the conflicts that we believe are of importance and should be resolved," Putin said at the start of the meeting as quoted in a translation on the State Department’s website. "And my last phone conversation with President Obama makes me convinced that it’s our sincere desire not only to pursue the process but to yield tangible results. And I hope that after today’s consultations - and please, by the way, give my regards to President Obama - I hope after today’s consultations, you’ll be able to advise him of the progress made and of a possible headway for us to make," the Russian leader said. Kerry said: "Well, Mr. President, thank you very much for taking time. I appreciate the opportunity to be able to meet. President Obama sends you his regards." "He thought it was a constructive conversation, and hopefully we will be able to make some genuine progress that is measurable and implementable that can make a difference to the course of events in Syria. So I look forward very much to a serious conversation this evening and again tomorrow with Sergey. And we have a lot of work to do," the U.S. top diplomat said. "The president and I both believe - this president - that the United States and Russia are in a position to make an enormous difference in the course of events - not just in Syria, but obviously Ukraine, and even in other potential areas of cooperation. So we’re anxious to get to work. We’ve done a lot of ground work, but we’re not where we need to be yet. We hope to be able to get there," Kerry said. "So I’m ready to work, and I know you are. Let’s go." In conclusion of the part of talks open for the press, Putin said: "President Obama drew my attention to the fact that Russian Federation helped release one of the American citizens [in Syria]." "And I’ll tell you that at your behest we’ll keep working in this way, and I really hope that if need be, the American side will reciprocate in efforts and would accommodate our request as well," the Russian president said. Kerry said in response: "Mr. President, well aware of your request. Let me say that we are all grateful for Russia’s help. You made a difference - the difference - and we’re very grateful for that. And we are indeed aware of your request for reciprocation."